lmmaker Darren Aronofsky joins producers and the astronauts behind National Geographic's "One Strange Rock" ten-part series at the Television Critics Association's press tour, Jan. 13. Pictured from top left to bottom right: Astronauts Nicole Stott, Jeff Hoffman, Leland Melvin, Mike Massimino, Peggy Whitson, Jerry Linenger and (bottom left) Chris Hadfield; "One Strange Rock" showrunner Arif Nurmohamed, Jane Root of Nutopia, Darren Aronofsky and Ari Handel with Protozoa Pictures and astronaut Mae Jemison. "This is the story of Earth, from the only people who have ever left it." 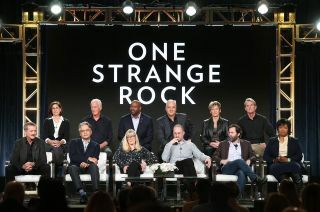 That, in a tagline, is the premise of "One Strange Rock," a ten-part television documentary series premiering in March on National Geographic Channel. Presented by filmmaker Darren Aronofsky ("mother! ", "Black Swan") and hosted by actor Will Smith, "One Strange Rock" reframes our view of the planet Earth from the perspective of eight of astronauts who spent time on board the International Space Station. "We haven't found another planet like this, with lifeforms that are building and creating these incredible systems and working together — and sometimes not working together," said Melvin. "It's really a strange and complicated rock that is able to do some pretty miraculous things." "They are part of the planet that have left the planet and looked back," said Alice Jones, who directed the tenth and final episode of the series. "It is that perspective shift that takes [the series] from being about the world we know to being the strange rock." "I think the astronauts are really what makes this series unique," Jones told collectSPACE.com. "What they bring is that emotional experience being there and seeing it with their eyes. They all say, 'We have seen photos of Earth and you kind of know what to expect, but when you go up there and look at it, it hits you here, [in the heart].'" "It is the emotional, personal storytelling that is interwoven throughout the factual content that I think is what probably makes it unique," she said. In addition to Melvin, "One Strange Rock" also features the experiences of astronauts Chris Hadfield, Jeffrey Hoffman, Mae Jemison, Nicole Stott, Jerry Linenger, Peggy Whitson and Michael Massimino. "We have chosen scientists or science-minded astronauts, not just military pilots, but people who have a real insight into the inner workings of the world and universe, who also happen to fly in space on the side, to host our series," said Jones. A ninth astronaut, Paolo Nespoli with the European Space Agency (ESA), also contributed to "One Strange Rock" but from behind the camera. "We have got fantastic footage from the space station over the last few years," said Jones, "but we were also able to work with ESA astronaut Paolo Nespoli. Darren Aronofsky spoke with him and we gave him training on a RED [HD] camera and in his spare time, Paolo filmed for us." Astronauts from "One Strange Rock" (left to right): Mae Jemison, Jeff Hoffman, Peggy Whitson, Leland Melvin, Jerry Linenger, Chris Hadfield, Nicole Stott and Mike Massimino. "We were super lucky that Paolo's [stay] overlapped with Peggy Whitson," said Jones. "So we've got beautifully shot footage of Peggy living aboard the space station." As the series' host, Will Smith ("Ali," "Men in Black") gives voice to the everyman. "Will Smith just fits perfectly, he is great," Jones said. "We wanted someone who was accessible and approachable, and had a warmth and charisma the audience could relate to. I think he'll be a great counterpoint with the astronauts." Watch the new trailer for National Geographic's "One Strange Rock" at collectSPACE.